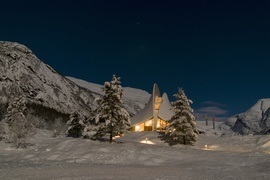 The Breheimsenter is a natural starting point for trips in Jostedalen. This unique building offers many services, to locals and tourists alike. The interactive exhibition covers Jostedalen, Jostedalsbreen & Breheimen National Parks and focuses on climate and glaciers. In addition there is a cinema which takes you on a tour around the glaciers through the years. The Breheimsenter was first built in 1993, designed by Architect Rolf Sande and his company A38. In 2011 a fire burnt the building to the ground, with the new, improved centre opened in 2013 by then Prime Minister Jens Stoltenberg. Since 1997 the Breheimsenter has been an authorised National Park Centre with responsibility for the nature and environment in both Breheimen and Jostedalsbreen National Parks.